The results of the general election have investors optimistic about the future of regulations affecting the industry. 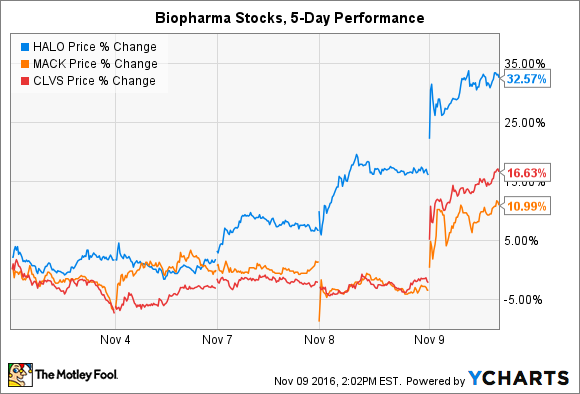 Many biopharma stocks are rising at least 10% today as investors are hopeful that the next president and, more importantly, the balance of power in Congress will not result in stricter regulations on the industry as many had appeared to be preparing for. Stocks including Halozyme Therapeutics (NASDAQ:HALO), Merrimack Pharmaceuticals (NASDAQ:MACK), and Clovis Oncology (NASDAQ:CLVS) are among those posting big gains in the aftermath of the general election. This year has been rough for biopharma stocks. A string of negative stories on drug prices has put the pharmaceutical industry under intense scrutiny, as many have questioned the high prices charged for prescription drugs and the rates of drug price increases. Thus, drug prices -- and how they are set by pharmaceutical companies -- has become a political issue. While a piece of legislation introduced in September sought to address the issue (and had support from both major political parties), it only proposed that pharmaceutical companies would have to disclose how and why drug prices are set or increased. In other words, it wouldn't play a direct role in setting prices, but was an attempt to increase pressure on companies through forced transparency. It did, however, signal that tougher regulations could be on the way, especially given the predictions of pre-election polls for both the White House and U.S. Senate. But the results of the election suggest that stricter regulations will not materialize as quickly as once thought, which removes some uncertainty and risk from the industry and has investors excited. That's especially true today for biopharma stocks that investors think have most of their potential upside ahead of them. Halozyme Therapeutics, Merrimack Pharmaceuticals, and Clovis Oncology have recently launched products, are preparing to launch products, and have drug candidates moving into mid- and late-stage clinical trials. HALO Price data by YCharts. Halozyme Therapeutics reported third-quarter 2016 earnings on Monday. In addition to rapidly growing revenue, the company provided updates to key in-house programs that will report in 2017 and partner updates that will likely boost sales growth in the near future. Merrimack Pharmaceuticals will report third-quarter 2016 earnings on Wednesday. It has steadily grown revenue since the end of Sept. 2015, reported updates from several early-stage studies this year, and has two phase 2 clinical trials reporting results in each 2017 and 2018. Investors are hopeful that the best days are still ahead for the company. Clovis Oncology is the only company on this list without revenue, but investors are hopeful that its lead drug candidate will gain approval as a treatment for ovarian cancer in 2017. The company closed the third quarter of this year with nearly $319 million in cash and cash equivalents and has plans to initiate additional studies for its lead drug candidate in ovarian, prostate, and gastroesophageal cancers before the end of 2016. There are many other biopharma stocks being lifted by the general market sentiment today, but given that the driving forces for clinical-stage companies are data, data, and more data, investors may want to acknowledge that any potential gains will be short-lived.